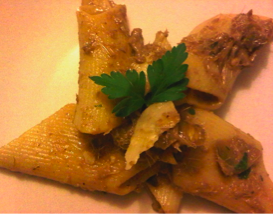 Recipe 19: And because i remember my mum and my aunt cooking a very good artichokes pasta, i decided to use one of the artichokes i bought in Portobello, to do the creamy sauce for some penne. Ingredients for 2 people: one big or 2 little artichokes, lemon, garlic, parsley, olive oil, salt and pepper, Parmesan, a bit of milk or cream and 200 gr penne. Clean the artichokes as written here. Then cut them in pieces and place them in a pan with olive oil and some garlic. I normally take this off once is goldish, but you can leave it if you like garlic. Let it cook for 15-20 minute adding salt, pepper, chopped parsley and some water if needed. Then let it cool down a bit. In the meantime place on the fire some water for the pasta and when boiling, add the penne or any other pasta shape you want. Take half of them and place them in a blender with some milk or cream and Parmesan. Once the artichokes cream is done, mix it in the pan with the rest of the artichokes and wait for the pasta to be ready. When the sauce is well mixed with the rest of the artichokes and the pasta is “al dente”, drain it and put it in the pan with a bit of the cooking water. Mix it well and serve hot with some Parmesan in flakes. Buon appetito! PS. Mamy che buono, molto meglio del carciofo semplice. Sara’ il latte, il sapore della roba cucinata fresca…non so, ma molto meglio di un qualsiasi sugo pronto al carciofo.